MAJESTIC VIEWS! Steps to North Conway Village's restaurants, shopping and ALL ITS ACTIVITIES. 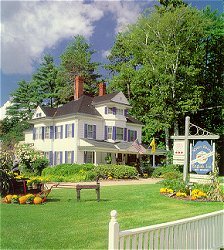 Take a scenic drive and view God's tapestry - the White Mountains in Autumn - Ski the WHITES in one of our Four Major Ski Areas (Alpine or X-C); play Golf at one of our prized courses; enjoy quiet interludes in our TWO PERSON JACUZZI SUITE or on the wicker-filled Verandah of this 1880's English Manor Home; swing in our hand-knotted hammock and dream a little dream; view the splendor of the mountains and ledges from one of our several decks or New England-crafted Adirondack chairs; walk to the Saco River right in the backyard with its pristine waters offering peace and tranquility; indulge yourself in Romance and Epicurean Delights in our Victorian fireplaced Parlor and handsome Study with English Teatime and freshly-baked cakes, goodies and scones; sip Sherry from a complimentary decanter in your antique-filled bedchamber. Be pampered with Gourmet Breakfasts by candlelight on English Wedgwood and Irish Lace, whilst soft piano concertos play by the fire. Or enjoy a gracious touch of Romance and Elegance with Breakfast-in-Bed. Decidedly small and intentionally memorable. 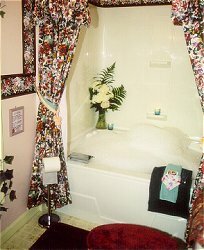 Luxurious Accommodations yet Affordably Opulent! 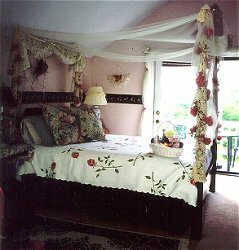 This and other North Conway Bed and Breakfast Inns can be found here in The Register.